Controversial video game, Six Days in Fallujah isn't just trying to tackle the events of a very real battle less than two years after it happened, it's trying to do so from all sides involved. 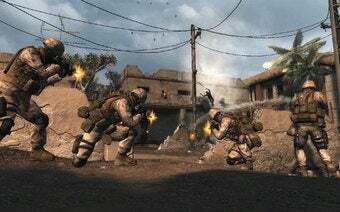 The game was made with contributions from the insurgents that fought Marines during the second battle of Fallujah (otherwise known as Operation Phantom Fury), according to Atomic Games' President Peter Tamte. "It's important for us to say that there are actually three communities that are very affected by the battle for Fallujah," Tamte said. "Certainly the Marines, certainly the Iraqi civilians within Fallujah, and the insurgents as well. We are actually getting contributions from all three of those communities so that we can get the kind of insight we're trying to get." Tamte wouldn't say exactly what "contributions" Atomic Games received, nor would he state whether or not anyone on the development team had spoken to insurgents. He did say the insurgents were "involved in the creation of the game," and that the developer knows that people "would just like this to be a recreation and we can't recreate [Operation Phantom Fury] without getting the perspectives of all the people who were involved." "We recreate the events as factually and as accurately as we possibly can," Creative Director Juan Benito said added. Atomic Games seems to be very aware that their game raises some questions and concerns for pretty much everyone – even people who probably won't play the game. Benito said, "There will be a broad range of reactions and opinions on the experience itself. And for some, they may have fun. People I think will have their own individual reactions to it and those will be across the board. And that's what we want. We want people to experience something that's going to challenge them, that's going to make them think and provide an unprecedented level of insight into a great military significance." While Atomic Games say talked to all sides involved for their game, the story will be focused on the surviving marines, Tamte said. "What we're trying to do is recreate the stories of the Marines that we've spoken with and that are involved in the creation," he said. "And we're telling those stories of those particular Marines." In this footage, solders take positions in a street littered with burnt-out cars and debris. A man - obviously of Middle Eastern ethnicity – comes running out of a house, hands in the air. The NPC chatter says something like "He's unarmed – wait…" The man ducks behind a car and pops back out with an RPG. Immediately the NPC soldiers open fire as more armed people pour out of surrounding houses. Like any other war game we're used to seeing, the main character takes a couple of hits and the screen begins to gray as he loses health. The soldier ducks behind a car and slowly the screen regains color. A heads-up display menu appears onscreen, letting the player (and we're aware now of being a player because of the HUD) choose an explosive. Then it's back to this-is-a-documentary mode as the HUD disappears and the soldier approaches a wall to the right of the street where the firefight still rages. He sets the charge and the wall caves in when it blows. The soldier then steps into what appears to be a house and shoots the first man he sees, gaining access into a room beyond which looks out onto the street where the insurgents are still shooting at the soldiers. From inside the house, the lone soldier flanks and then gets behind the insurgents, shooting three in the back. "As we've watched the dialog that's taken place about the game, there is definitely one point that we want people to understand about the game," he said. "And that is, it's not about the politics of whether the US should have been there or not. It is really about the stories of the Marines who were in Fallujah and the question, the debate about [the politics], that is something for the politicians to worry about. We're focused now on what actually happened on the ground." Which brings us right back to the big question that nobody – not even the developer – can really seem to answer: What is Six Days trying to accomplish beyond provoking a reaction? Is it a game, a communications tool, or propaganda? While there are no definitive answers as yet, it seems significant that the developer calls the game a communications tool but is asking gamers to pay money for it. And it bothers me in a way I can't quite explain that the Marines that were in Operation Phantom Fury will be in the game as NPCs you can interact with; like the licensed characters you see in sports or movie games. Here's the worst part, though: we cannot say without playing the game what would make Six Days in Fallujah better. Would it be better to have total realism if Atomic Games had spoken directly to insurgents, included scenes where you could watch the Marines killed in action die exactly how they were killed in real life (even if it were from friendly fire) and showed the use of white phosphorus during the operation? Or would it be better to have it be "just a video game" with regenerating health, HUDs and a certain casual – if tactless – distance from the events via unrealistic depictions of the battle? The irony here is, once those questions are answered and all can weigh in on those complex issues, the game will already be out and any damage may already be done.